Proprietary Name: Hyperrab What is the Proprietary Name? Non-Proprietary Name: Rabies Immune Globulin (human) What is the Non-Proprietary Name? Hyperrab with NDC 13533-318 is a a plasma derivative product labeled by Grifols Usa, Llc. The generic name of Hyperrab is rabies immune globulin (human). The product's dosage form is injection, solution and is administered via infiltration; intramuscular form. FDA Application Number: BLA101144 What is the FDA Application Number? Start Marketing Date: 06-12-1974 What is the Start Marketing Date? HYPERRAB is a human rabies immune globulin indicated for postexposure prophylaxis, along with rabies vaccine, for all persons suspected of exposure to rabies. Limitation of UsePersons who have been previously immunized with rabies vaccine and have a confirmed adequate rabies antibody titer should receive only vaccine. (1-3)For unvaccinated persons, the combination of HYPERRAB and vaccine is recommended for both bite and nonbite exposures regardless of the time interval between exposure and initiation of post-exposure prophylaxis. (1-3) Beyond 7 days (after the first vaccine dose), HYPERRAB is not indicated since an antibody response to vaccine is presumed to have occurred. For infiltration and intramuscular use only.The strength of HYPERRAB is 300 IU/mL. Use HYPERRAB in combination with rabies vaccine series to be effective. Do not use HYPERRAB alone for prevention.Administer HYPERRAB within 7 days after the first dose of rabies vaccine.Rabies Postexposure Prophylaxis ScheduleAdapted from reference ‎1.Vaccination StatusTreatmentRegimenThese regimens are applicable for all age groups, including children. Not previously vaccinated Wound cleansing • Cleanse all wounds immediately and thoroughly with soap and water. • Irrigate the wounds with a virucidal agent such as a povidone-iodine solution, if available. HYPERRAB 20 IU/kg body weight OR 0.0665 mL/kg body weight Single dose • Administer HYPERRAB as soon as possible after exposure, preferably at the time of the first vaccine dose. • Infiltrate the full dose of HYPERRAB thoroughly in the area around and into the wound(s), if anatomically feasible. [see Dosage and Administration (‎2.3)]• Inject the remainder, if any, intramuscularly at an anatomical site distant from the site of vaccine administration. [see Dosage and Administration (‎2.3)]• Do not exceed the recommended dose of HYPERRAB, otherwise the active production of rabies antibody may be partially suppressed. [see Drug Interactions (7)]• Use separate syringes, needles, and anatomical injection sites for HYPERRAB and for rabies vaccine. Rabies Vaccine • Administer rabies vaccine on day 0Day 0 is the day the first dose of vaccine is administered. Refer to vaccine manufacturer’s instructions or to the recommendations of the Advisory Committee on Immunization Practices (ACIP)(1-3) for appropriate rabies vaccine formulations, schedules and dosages.• Complete a rabies vaccination series for previously unvaccinated persons. Previously vaccinatedAny person with a history of rabies vaccination and a documented history of antibody response to the prior vaccination. Wound cleansing • Cleanse all wounds immediately and thoroughly with soap and water. • Irrigate the wounds with a virucidal agent such as a povidone-iodine solution, if available. HYPERRAB • Do not administer HYPERRAB. [see Indications and Usage (‎1)] Rabies Vaccine • Administer rabies vaccine on day 0‡. • Complete a rabies vaccination series for previously vaccinated persons. Calculate the volume of HYPERRAB for the recommended dose of 20 IU/kg.Ensure the correct strength is used for the calculation. HYPERRAB is formulated with a strength of 300 IU/mL. The predecessor product, HYPERRAB S/D was formulated at 150 IU/mL. The volume required of HYPERRAB (300 IU/mL) to achieve the recommended dose of 20 IU/kg is approximately one half of that required for the previous HYPERRAB S/D (150 IU/mL).Visually inspect parenteral drug products for particulate matter and discoloration prior to administration, whenever solution and container permit. HYPERRAB is a clear or slightly opalescent, and colorless or pale yellow or light brown sterile solution.Do not use HYPERRAB if the product shows any sign of tampering. Notify Grifols Therapeutics Inc. immediately [1-800-520-2807].Do not freeze. Do not use any solution that has been frozen. Administer HYPERRAB at the time of the first vaccine dose (day 0), but no later than day 7(1-3).Infiltrate the full dose of HYPERRAB in the area around the wound, if anatomically feasible. Dilute HYPERRAB with an equal volume of dextrose, 5% (D5W), if additional volume is needed to infiltrate the entire wound. Do not dilute with normal saline.Inject the remainder, if any, of the HYPERRAB dose intramuscularly into the deltoid muscle of the upper arm or into the lateral thigh muscle, and distant from the site of vaccine administration.Do not administer HYPERRAB in the same syringe or needle or in the same anatomic site as vaccine. HYPERRAB is a sterile, 300 IU/mL solution for injection supplied in 1 mL and 5 mL single- dose vials. The 1 mL vial is sufficient for a child weighing 15 kg. 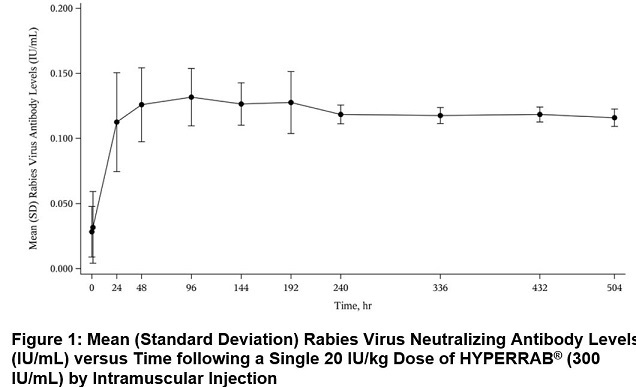 The 5 mL vial is sufficient for an adult weighing 75 kg.HYPERRAB is standardized against the U.S. Standard Rabies Immune Globulin to contain a potency of ≥300 IU/mL. The U.S. unit of potency is equivalent to the international unit (IU) for rabies antibody. Severe hypersensitivity reactions may occur with HYPERRAB. Patients with a history of prior systemic allergic reactions to human immunoglobulin preparations are at a greater risk of developing severe hypersensitivity and anaphylactic reactions. Have epinephrine available for treatment of acute allergic symptoms, should they occur. Patients with isolated immunoglobulin A (IgA) deficiency may develop severe hypersensitivity reactions to HYPERRAB, or subsequently, to the administration of blood products that contain IgA. HYPERRAB is made from human blood and may carry a risk of transmitting infectious agents, e.g., viruses, the variant Creutzfeldt-Jakob disease (vCJD) agent, and, theoretically, the Creutzfeldt-Jakob disease (CJD) agent. HYPERRAB is purified from human plasma obtained from healthy donors. When medicinal biological products are administered, infectious diseases due to transmission of pathogens cannot be totally excluded. However, in the case of products prepared from human plasma, the risk of transmission of pathogens is reduced by: (1) epidemiological controls on the donor population and selection of individual donors by a medical interview and screening of individual donations and plasma pools for viral infection markers; (2) testing of plasma for hepatitis C virus (HCV), human immunodeficiency virus (HIV), hepatitis B virus (HBV), HAV and human parvovirus (B19V) genomic material; and (3) manufacturing procedures with demonstrated capacity to inactivate/remove pathogens.ALL infections thought by a physician possibly to have been transmitted by this product should be reported by the physician or other healthcare provider to Grifols Therapeutics Inc. [1-800-520-2807]. Because clinical trials are conducted under widely varying conditions, adverse reaction rates observed in the clinical trials of a drug cannot be directly compared to rates in the clinical trials of another drug and many not reflect the rates observed in practice. The new formulation for HYPERRAB is manufactured using caprylate/chromatography purification and has a rabies antibody concentration of 300 IU/mL. The previous formulation, HYPERRAB S/D, was manufactured using a solvent detergent process and had a rabies antibody concentration of 150 IU/mL. These products were evaluated in 2 clinical trials in a total of 20 healthy subjects using a 20 IU/kg single dose. The initial study evaluated the original 150 IU/mL HYPERRAB S/D in 8 subjects and the second study evaluated HYPERRAB in 12 subjects. The original study of HYPERRAB S/D reported headache (1/8; 13%).In the study with HYPERRAB at 300 IU/mL, 5 subjects (5/12; 42%) experienced at least 1 adverse reaction. These were: injection site pain (4/12; 33%), injection site nodule (1/12; 8%), abdominal pain (1/12; 8%), diarrhea (1/12; 8%), flatulence (1/12; 8%), headache (1/12; 8%), nasal congestion (1/12; 8%), and oropharyngeal pain (1/12; 8%). Risk SummaryThere are no data with HYPERRAB use in pregnant women to inform a drug-associated risk. Animal reproduction studies have not been conducted with HYPERRAB. It is not known whether HYPERRAB can cause fetal harm when administered to a pregnant woman or can affect reproduction capacity. HYPERRAB should be given to a pregnant woman only if clearly needed. In the U.S. general population, the estimated backgrounds risk of major birth defect and miscarriage in clinically recognized pregnancies is 2-4% and 15-20%, respectively. Risk SummaryThere is no information regarding the presence of HYPERRAB in human milk, the effect on the breastfed infant, or the effects on milk production. The developmental and health benefits of breastfeeding should be considered along with the mother’s clinical need for HYPERRAB and any potential adverse effects on the breastfed infant from HYPERRAB. HYPERRAB is a clear or slightly opalescent, and colorless or pale yellow or light brown sterile solution of human antirabies immune globulin for infiltration and intramuscular administration. HYPERRAB contains no preservative. HYPERRAB is prepared from pools of human plasma collected from healthy donors (hyperimmunized with rabies vaccine) by a combination of cold ethanol fractionation, caprylate precipitation and filtration, caprylate incubation, anion-exchange chromatography, nanofiltration and low pH incubation. HYPERRAB consists of 15 to 18% protein at pH 4.1 to 4.8 in 0.16 to 0.26 M glycine. The product is standardized against the U.S. Standard Rabies Immune Globulin to contain a potency value of not less than 300 IU/mL. The U.S. unit of potency is equivalent to the international unit (IU) for rabies antibody.When medicinal biological products are administered, infectious diseases due to transmission of pathogens cannot be totally excluded. However, in the case of products prepared from human plasma, the risk of transmission of pathogens is reduced by epidemiological surveillance of the donor population and selection of individual donors by medical interview; testing of individual donations and plasma pools; and the presence in the manufacturing processes of steps with demonstrated capacity to inactivate/remove pathogens. In the manufacturing process of HYPERRAB, there are several steps with the capacity for virus inactivation or removal. (6) The main steps of the manufacturing process that contribute to the virus clearance capacity are as follows:Caprylate precipitation/depth filtrationCaprylate incubationDepth filtrationColumn chromatographyNanofiltrationLow pH final container incubationTo provide additional assurance of the pathogen safety of the final product, the capacity of the HYPERRAB manufacturing process to remove and/or inactivate viruses has been demonstrated by laboratory spiking studies on a scaled down process model using a wide range of viruses with diverse physicochemical properties.The combination of all of the above mentioned measures provides the final product with a high margin of safety from the potential risk of transmission of infectious viruses.The caprylate/chromatography manufacturing process was also investigated for its capacity to decrease the infectivity of an experimental agent of transmissible spongiform encephalopathy (TSE), considered as a model for the variant Creutzfeldt-Jakob disease (vCJD), and Creutzfeldt-Jakob disease (CJD) agents. (6) These studies provide reasonable assurance that low levels of vCJD/CJD agent infectivity, if present in the starting material, would be removed by the caprylate/chromatography manufacturing process. In a clinical study of 12 healthy human subjects receiving a 20 IU/kg intramuscular dose of HYPERRAB detectable passive rabies neutralizing antibody was present by 24 hours and persisted through the 21 day follow-up evaluation period. Figure 1 shows the mean levels of rabies virus antibodies in IU/mL across the 21 day evaluation period and indicates that the titer remains stable during this period. 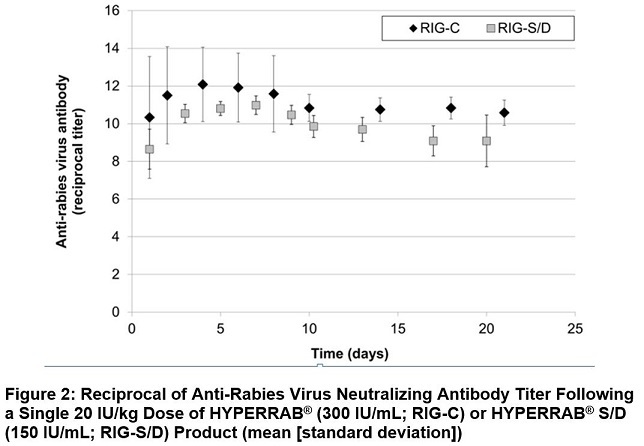 This level of passive rabies neutralizing antibody is similar to that reported in the literature for administration of human rabies immune globulin, and is clinically important because it provides interim protection until the host immune response to rabies vaccine produces definitive protective titers of neutralizing rabies antibody (therefore the rabies vaccine series is also essential). (23-24)The previous formulation, HYPERRAB S/D, was studied in 8 healthy subjects over 21 days. As with the new formulation, rabies neutralizing antibody was present by 24 hours and persisted through the 21 day follow up period (Figure 2). Centers for Disease Control and Prevention. Human rabies prevention — United States, 2008: Recommendations of the Advisory Committee on Immunization Practices. MMWR. 2008;57(RR03):1-26, 28.World Health Organization. WHO Expert Consultation on Rabies: Second report. 2013. WHO technical report series, No. 982.Centers for Disease Control and Prevention. Use of a reduced (4-dose) vaccine schedule for postexposure prophylaxis to prevent human rabies. Recommendations of the Advisory Committee on Immunization Practices. MMWR. 2010;59(RR02):1-9. Erratum in: MMWR 2010;59(16):493.Fudenberg HH. Sensitization to immunoglobulins and hazards of gamma globulin therapy. In: Merler E (editor). Immunoglobulins: biologic aspects and clinical uses. Washington, DC: National Academy of Science; 1970, p. 211-20. Centers for Disease Control and Prevention. General recommendations on immunization: Recommendations of the Advisory Committee on Immunization Practices (ACIP). MMWR. 2011;60(RR02):1-61. Erratum in: MMWR 2011;60(29):993.Barnette D, Roth NJ, Hotta J, et al. Pathogen safety profile of a 10% IgG preparation manufactured using a depth filtration-modified process. Biologicals. 2012;40:247-53.Baltazard M, Bahmanyar M, Ghodssi M, et al. Essai pratique du sérum antirabique chez les mordus par loups enragés. [Practical test of anti-rabies serum in bites by rabid wolves]. Bull WHO. 1955;13:747-72. Habel K, Koprowski H. Laboratory data supporting the clinical trial of antirabies serum in persons bitten by a rabid wolf. Bull WHO. 1955;13:773-9.Selimov M, Boltucij L, Semenova E, et al. [The use of antirabies gamma globulin in subjects severely bitten by rabid wolves or other animals.] J Hyg Epidemiol Microbiol Immunol (Praha). 1959;3:168-80.Atanasiu P, Bahmanyar M, Baltazard M, et al. Rabies neutralizing antibody response to different schedules of serum and vaccine inoculations in non-exposed persons. Bull WHO. 1956;14:593-611.Atanasiu P, Bahmanyar M, Baltazard M, et al. Rabies neutralizing antibody response to different schedules of serum and vaccine inoculations in non-exposed persons: Part II. Bull WHO. 1957;17:911-32.Atanasiu P, Cannon DA, Dean DJ, et al. Rabies neutralizing antibody response to different schedules of serum and vaccine inoculations in non-exposed persons: Part 3. Bull WHO. 1961;25:103-14.Atanasiu P, Dean DJ, Habel K, et al. Rabies neutralizing antibody response to different schedules of serum and vaccine inoculations in non-exposed persons: Part 4. Bull WHO. 1967;36:361-5.Cabasso VJ, Loofbourow JC, Roby RE, et al. Rabies immune globulin of human origin: preparation and dosage determination in non-exposed volunteer subjects. Bull WHO. 1971;45:303-15.Loofbourow JC, Cabasso VJ, Roby RE, et al. Rabies immune globin (human): clinical trials and dose determination. JAMA. 1971;217(13):1825-31.Plotkin SA. New rabies vaccine halts disease — without severe reactions. Mod Med. 1977;45(20):45-8.Plotkin SA, Wiktor TJ, Koprowski H, et al. Immunization schedules for the new human diploid cell vaccine against rabies. Am J Epidemiol. 1976;103(1):75-80.Hafkin B, Hattwick MA, Smith JS, et al. A comparison of a WI-38 vaccine and duck embryo vaccine for preexposure rabies prophylaxis. Am J Epidemiol. 1978;107(5):439-43.Kuwert EK, Marcus I, Höher PG. Neutralizing and complement-fixing antibody responses in pre- and post-exposure vaccinees to a rabies vaccine produced in human diploid cells. J Biol Stand. 1976;4(4):249-62.Grandien M. Evaluation of tests for rabies antibody and analysis of serum responses after administration of three different types of rabies vaccines. J Clin Microbiol. 1977;5(3):263-7.Kuwert EK, Marcus I, Werner J, et al. Postexpositionelle Schutzimpfung des Menschen gegen Tollwut mit einer neu-entwickelten Gewebekulturvakzine (HDCS-Impfstoff). [Post exposure use of human diploid cell culture rabies vaccine (author's transl)]. Zentralbl Bakteriol [A].1977;239(4):437-58.Bahmanyar M, Fayaz A, Nour-Salehi S, et al. Successful protection of humans exposed to rabies infection: postexposure treatment with the new human diploid cell rabies vaccine and antirabies serum. JAMA. 1976;236(24):2751-4.Helmick CG, Johnston C, Sumner J, et al. A clinical study of Merieux human rabies immune globulin. J Biol Stand. 1982;(10):357-67.Lang J, Gravenstein S, Briggs D. Evaluation of the safety and immunogenicity of a new, heat-treated human rabies immune globulin using a sham, post-exposure prophylaxis of rabies. Biologicals 1998;(26):7-15. HYPERRAB is supplied in 1 mL and 5 mL single dose vials with a potency value of not less than 300 IU/mL. HYPERRAB contains no preservative and is not made with natural rubber latex. NDC NumberSize13533-318-011 mL13533-318-055 mlStore HYPERRAB at (2 to 8°C, 36 to 46°F).Do not freeze.Do not use after expiration date. Rabies Immune Globulin (Human)HyperRAB® 300 IU/mLSolution for Infiltration and Intramuscular Injection300 IU/mL Suitable for use with Rabies Vaccine 5 mLNDC13533-318-05GRIFOLSThe patient and physician should discuss the risks and benefits of this product.One Single Dose VialFOR INTRAMUSCULAR INJECTION ONLY. DO NOT GIVE INTRAVENOUSLY.For complete dosage and administration information, read enclosed package insert.Store at 2–8ºC (36–46ºF). Do not freeze.If the shrink band is absent or shows any sign of tampering, do not use the product and notify Grifols Therapeutics Inc. immediately. Not returnable for credit or exchange.Rx onlyRabies Immune Globulin (Human) is a sterile solution of immunoglobulin containing 15%–18% protein stabilized with 0.16 to 0.26 M glycine.The potency of each vial is 300 IU/mL based on the U.S. Standard Rabies Immune Globulin.Not made with natural rubber latex.No preservativeGrifols Therapeutics Inc. Research Triangle Park, NC 27709 USA U.S. License No. 1871Carton: 3046688GTIN 00313533318055NDC 13533-318-50 5 mLRabies Immune Globulin (Human)HyperRAB®300 IU/mLThe patient and physician should discuss the risks and benefits of this product.Grifols Therapeutics Inc. RTP, NC 27709 USA U.S. License No. 1871Rx onlyOne Single Dose Vial Do not give intravenously. Dosage: 20 IU/kg in conjunction with Rabies Vaccine. See directions before using.3047796Lot/Exp.